In recent years 4K resolution monitors and TVs have become increasingly common in commercial and business environments alike as they have a resolution four times greater than standard full HD. Because of this, 4K monitors and cameras are now becoming more and more common in the medical scene. Read on to specifically find out how 4K monitors are beneficial for use with endoscopy and operating microscopes. When working on large full HD monitors, you can often see the individual pixels of the screen. For example, an average person looking at a 31-inch full HD monitor will be able to see the pixels even when viewing the monitor from one meter away. However, when viewing a 4K monitor of the same size – like the CuratOR EX3140 – from the same distance, pixels cannot be perceived. If not viewed from far away, these large full HD monitors can be incredibly distracting and produce blurry images due to the large size of the pixels. If this kind of monitor is used when operating on small blood vessels using miniscule sutures, you may not see an image clearly enough to make out the individual objects in your scope of vision. 4K monitors allow surgeons to clearly see inside a patient, ensuring that they place their tools in the intended areas so as not to accidentally cause any harm. 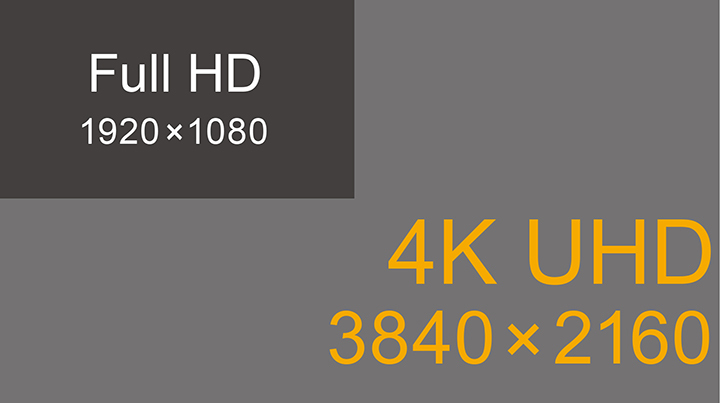 Because 4K resolution is four times denser than full HD resolution when used on the same sized monitor, small objects such as sutures and blood vessels which were blurry on full HD, will be much clearer in 4K resolution. Furthermore, because the pixel size is reduced, you can no longer see individual pixels even when viewing the monitor at close range. This means that where a full HD monitor can only be comfortably used at a distance, a 4K monitor can be comfortably viewed at much closer distances without noticing individual pixels. 4K monitors are able to clearly show sutures without any blurring. These days minimally invasive surgery is the preferred method of surgery for many operations as it reduces the burden on patients, compared to open surgery. But minimally invasive surgery comes with a large drawback: visibility. Minimally invasive surgery restricts one’s visibility to what can be seen by the camera and displayed on the monitor, which reduces depth perception and image clarity (resolution, brightness and color). By using a 4K monitor with a 4K camera, you can restore some of the visibility that is lost by improving the clarity of the image with the higher pixel density that 4K provides. This improvement in clarity can in turn improve depth perception, which is reliant on how we perceive light interacting with objects. By being able to see how light reacts on objects more clearly, we ultimately can sense depth better. Of course to get the most out of a 4K monitor, a 4K camera/ input is recommended to ensure that images are as crisp and detailed as possible. However, if you haven’t upgraded to a 4K camera, you can still benefit from a 4K screen with EIZO’s S.R.S.C. function. The S.R.S.C. (Smart Resolution with Sparse Coding) function which is available on some models, is a function that enhances the clarity of expanded images. This is perfect for when full HD images are displayed on 4K monitors, allowing the user to make full use of their 4K monitor without requiring 4K input. To get all the benefits of 4K – unperceivable pixels, increased depth perception and visibility, and EIZO’s S.R.S.C. 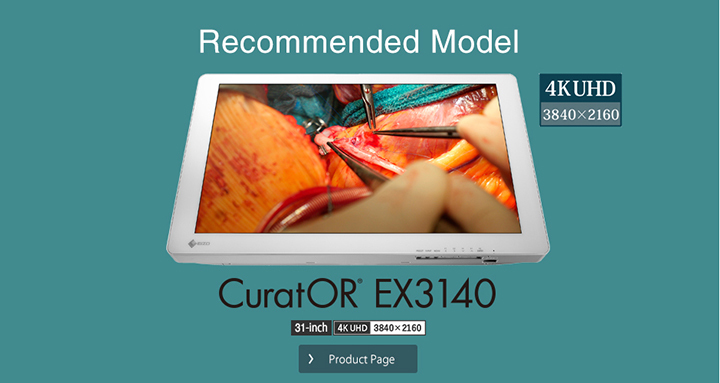 visibility enhancing function – we recommend using the CuratOR EX3140 surgical monitor.